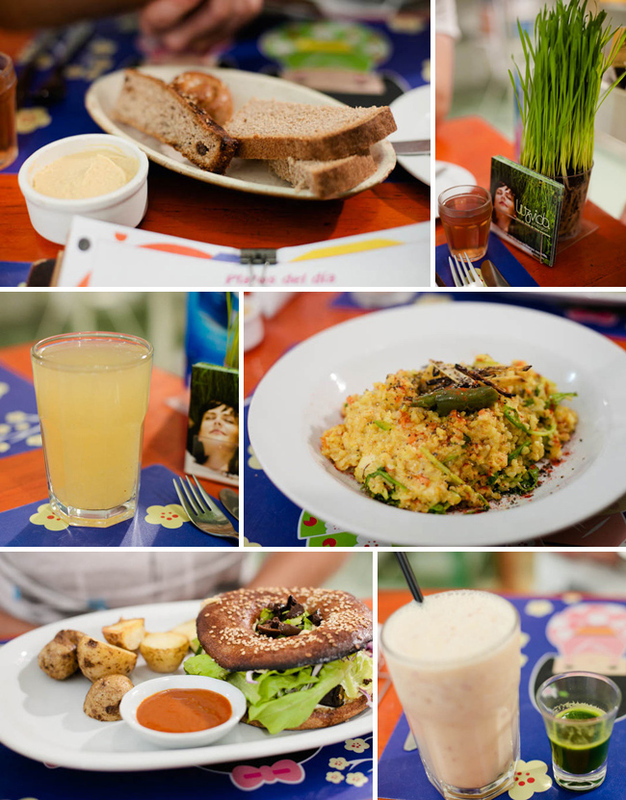 BA Verde :: Vegetarian Restaurant | .liveit.loveit.blogit. We heard about Buenos Aires Verde from one of the hubs’ veggie friends who spent some time in BA last year. Buenos Aires–the city of the parilla–is the not the most veggie-friendly (or health-nut friendly) city in the world. So, we were pretty excited to get a list of good, healthy, veggie options to try out when our arteries just needed a break from the meat and cheese. One of the most exciting sounding restaurants on the list was Buenos Aires Verde, a Palermo Hollywood restaurant. From the street, Buenos Aires Verde is true to its name. The exterior is bright green, making it hard to miss, despite it’s small size! When you enter the restaurant, you are greeted by a delicious looking raw treats display case. We didn’t try any (since we were super full from lunch), but if I’m in the neighbourhood, I’ll be sure to pick one up. The small restaurant is full of brightly coloured, tightly packed tables, and there is a small health food grocery section. The tables are adorned with purple japanese-style placemats and bright green wheatgrass centrepieces. The walls are full of chalkboards listing features from the menus in brightly coloured chalk. The restaurant was medium-busy throughout our visit (a Thursday at around 1:00), and the service was decent. 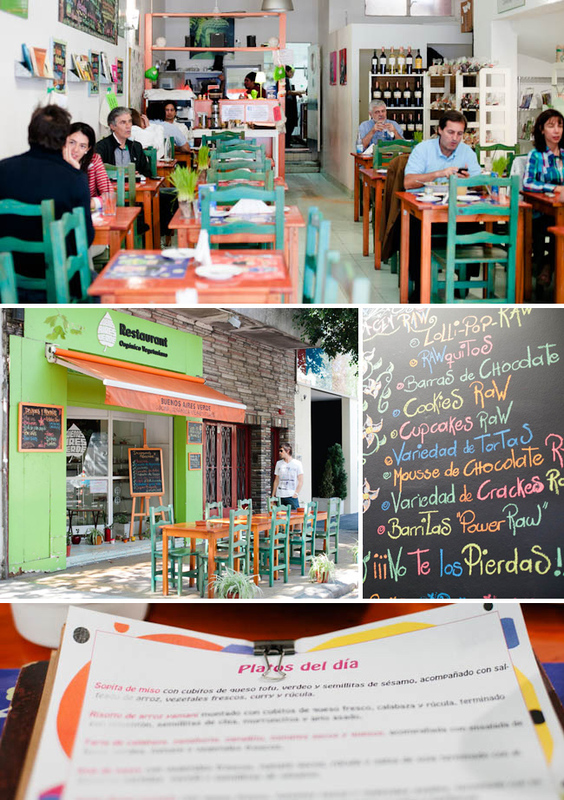 Buenos Aires Verde features an extensive menu ranging from about 40-60 pesos for most dishes. It’s not a vegan restaurant – as most dishes feature cheese – but I think there are a handful of things on the menu that could fit the bill if you are a vegan. The first page print out lists the platos del dia, big healthy meals for 33 pesos. Now we’re talking! Upon our arrival we were served a cold sweet tea (I loved it, it was too sweet for the hubs’ taste) and whole grain breads and hummus. I think I’ve mentioned before that the vast majority of the bread in BA is not great, this was a big exception to that rule. Moist, flavourful and delicious. We ordered the butternut squash risotto and the super bagel, both from the platos del dia menu. I topped my meal off with a ginger lemonade (15 pesos) and the hubs had an apple almond-milk shake with a shot of wheatgrass on the side (27 pesos). The butternut squash was rich and creamy and delicious, but watch out if you are on a diet, it was fairly heavy on the cheese. The super bagel featured roasted vegetables, and I’m pretty sure they were roasted in sugar. I found the sweetness overwhelmed all the other flavours, and wouldn’t order that again. That’s probably a taste thing though, the inherent sweetness in a roasted vegetable is about as sweet as I like my savoury foods. The bagel itself was whole grain, thin, not to dense, and tasty. The hubs’ apple shake wasn’t my fave, it was a little chunky. My lemonade was yummy, with small bits of ginger, but lemonade is forever ruined for me after the delicious lemonade at Salgado Alimentos. Buenos Aires Verde, Gorriti 5657, Palermo Hollywood, Buenos Aires, Mon to Sat, 9-late. No credit cards. 2 peso cover pp. At 112 pesos ($26) for two, the meal was an ok value. The food was tasty, the drinks were ok, the 2 peso cubierto (cover) was just annoying. 2 pesos? Really? At it to my meal. Next time (and if we were here for longer, we would return) we would split a water, which would bring it down to about 80 pesos ($19).